← How to convert PX3 to BMP and set image resolution? In this article, you will see how to convert the characters in image to searchable text of PDF document by GUI application and command line application. The application to be used in this conversion is VeryPDF Image to PDF OCR Converter and VeryPDF Image to PDF OCR Converter Command Line, which can all be free downloaded at their homepage. After downloading Image to PDF OCR Converter to your computer, you need to install it by following the installation wizard and then you are allowed to use the application. Please open it at first by click “Start”—“All Programs”—“Image2PDF OCR v3.2”—“Image2PDF OCR v3.2”. Then you will see the main interface of the application on the screen of your computer. Please see it in Figure 1. Then you need to add scanned image into the application by clicking “Add File (s)” button to open file picker window which you often use when you want to open some file in some program. Choosing the document and click “Open” button in the window and then the file to be converted will be shown in file list. When you click the file, you can see its preview in the preview frame. You can also click “Image (I)” button to zoom the image. 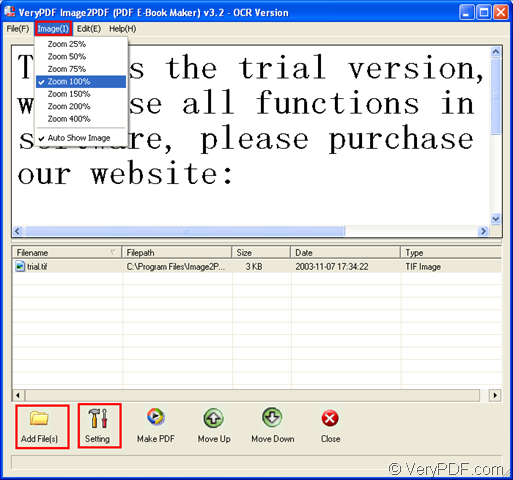 Click “Setting” button to open the dialog box “PDF E-Book Maker OCR-Version” in which you can set different kinds of parameters for the output PDF document. Click “OCR” tab of the tab control and check “Use OCR” option. Then please click “OK” button. To run the conversion from image to searchable text of PDF document, please right click the image file you want to convert and click “convert selected 1 file into one pdf file” option in popup floating item. Then you will see “Save as” dialog box pop up, in which you are able to save the target file and run the conversion by clicking “Save” button. After downloading Image to PDF OCR Converter Command Line to your computer, there is no need to install it. Please just unzip the file to some location and then the application will be runnable at once. The called program in the conversion from image to searchable text of PDF document is the executable file img2pdf.exe. There is a successfully run command line in MS-DOS interface which is shown in Figure 2 and this can give you a clear illustration about the command line usage. "C:\Program Files\image2pdf_cmd3.50_ocr\img2pdf.exe" -x 1 -d creator -r 0 -o c:\1.pdf "C:\Documents and Settings\admin\Desktop\demo\ocr\german.bmp"
"C:\Program Files\image2pdf_cmd3.50_ocr\img2pdf.exe" is the path of called program. -x 1 if for creating searchable PDF document. -d creator is to set PDF creator. -r 0 is to use the default image width and height information. -o c:\1.pdf is to specify the target file path. "C:\Documents and Settings\admin\Desktop\demo\ocr\german.bmp" is the path of source image file. Then you need to press “Enter” button to run the conversion. If you have any problems with this two versions of application, just come to our live chat support or leave a message to us. How to convert PDF to raster image and print PDF via command line? How to convert a web page to ps? How to convert PRN to PCX and rotate the page? How to convert OpenOffice documents of ODT to JPC? How do I use your PDFcamp Printer as a virtual PDF Printer? How to rotate the page while converting emf to ps? How to call PDFPrint SDK from Windows 64bit (x64) system? How to change image formats and remove noise in image? How to convert PDF with tables and scanned image to editable MS word format? This entry was posted in OCR Products. Bookmark the permalink.